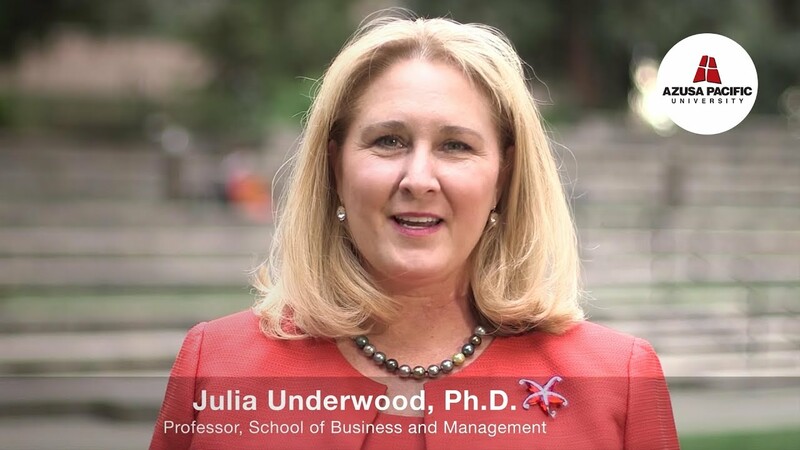 Julia Underwood, Ph.D., has worked in higher education for more than 25 years, joining the School of Business and Management faculty in 2001. Key responsibilities have included chair of the undergraduate programs; creator and director of SBM Europe—the university’s largest summer intensive academic-credit-earning study abroad program; and faculty moderator presiding over the faculty senate and representing faculty to administration and the Board of Trustees. She holds board-level posts with the Christian Business Faculty Association and International Assembly for Collegiate Business Education. An example of her strategic insight is the creation and implementation of a model for faculty seeking understanding in promoting a Christian worldview in their research and the classroom. The model has gained international attention and is delivered to faculty through an annual professional development conference she organizes and leads with a colleague. Underwood’s research areas include customer service and customer satisfaction measurement, faith integration, character, gender issues, and leadership. Her thought-provoking work has resulted in numerous international, national, and regional speaking engagements influencing audiences through conference presentations, guest lecturing and publications. Prior to APU, she worked with several management consulting firms. Her practice areas include organizational diagnosis, change and training addressing organizational effectiveness, customer satisfaction, performance measurement and improvement, and management coaching, along with feedback and follow-up within organizations ranging from 10 employees to Fortune 100 companies.